We have previously gone through various forms fundamental analysis from DCF Analysis, Comparable Company analysis and Comparable Transaction Analysis. In some shape or form, all these analyse the value of a company from a fundamental perspective, let it be looking at the company’s cash-flows, see where it trades in comparison to peers, or previous transactions. One sub-segment of investing form that investors focus on is Event Driven Investing. We will below go through one subsector of this type of investing called Merger Arbitrage in more detail. The basis for Event-Driven investing is to take advantage of potential pricing inefficiencies that occur prior to or after a corporate event. These can, for example, be a merger, an acquisition, a spin-off or bankruptcy. Professional investors such as hedge-funds like to look at these type of situations as they give attractive relative returns. These type of investments tends to have less correlation with the day-to-day movements of the markets, and more specifically their returns and outcomes are mostly connected to a specific event. This subsequently tends to give good risk-adjusted returns for the investors. There are two main types of mergers. It is either a cash-deal or a stock merger. Within a cash-deal, the buying company acquires the target company’s shares straight-up for cash. In a stock deal, the target company’s shareholders receive stocks in the acquiring company. As we previously noted in the comparable transaction analysis is that in conjugation with a merger, the acquiring company often needs to pay a premium to fully acquire the target company. This comes into effect in conjugation with a merger. When a merger or acquisition is announced, most of the time, there is an instant reaction to the announcement. The target company’s share price rallies close to the offer price. Most of the time the share price does not fully rise to the offer price. This difference/spread is due to the risk of the deal not closing. As an investor who does merger-arbitrage, the focus is to profit from this spread. When a merger is announced, it is common the following thing happens. The stock of the acquiring company goes down. Either slightly or more. Regulatory: The regulatory of risk lies in that different regulators around the world need to approve the acquisition. In the US these regulators are SEC, FTC and DoJ. In Europe, it is the EU competition authority. There are similar regulators in other big markets such as China and Japan. If the merger only involves let say two companies that only have operations in the US, only US regulators will have a look at the transaction. If it an international deal, regulators around the world will have a look and need to approve. The main subject that regulators look at in conjugation of a merger is competition. Will the new entity get too high market-share or pricing power or anything else that might stifle general competition in the market. Recently, another factor has also started influencing regulators when they look at a transaction. If the target company is of strategic interest to the country. For example, this has happened when Chinese companies have been trying to buy various types of companies in the US and Europe. Mainly within the technology sector. Companies try to address these issues prior to announcing the deal. But one never knows. As an event-driven investor in the merger arbitrage space, this is a big part of the analysis. Investors analyses the deal and potential effects. Look at precedent deals and see what has been approved earlier. Some investors have competition lawyers in various jurisdictions analyze the merger and see if they believe will get approval. Financing: When the acquiring company makes an offer for a target, they need to have financed the purchase. Very seldom, especially if it is a big transaction will the acquiring company have enough cash on their balance sheet to make the purchase. In those situations, they go to various banks and asks them for financing for the deal. This financing could be conditional on various parameters and often can change if something happens in conjugation to the deal or general markets. Financing risks tend most often be a smaller risk than the regulatory risk in transactions unless there is general financial turmoil. Shareholder Votes: Another important risk/variable is the shareholder vote. When a deal is announced, at least 90% of the shareholders need to approve the vote. There might be a situation which certain shareholders believe the offer price is too low and won’t accept the offer. Other situations, there might be a large or controlling shareholder that do not want to sell the company or their holdings within it. As a merger arbitrage investor, one tries to contact or assess in some shape or form what the major shareholders think about the offer to gauge if the deal will go through or if the acquirer needs to either raise the offer, do other concessions or totally accept that deal is not possible. These are the main risk of a deal closing. Merger arbitrage investor, spend majority of the time analyzing these three risks and factors to feel comfortable if they believe the deal happening. Below are two examples of how to conduct the actual merger arbitrage analysis and calculating the expected returns. An annualized return of 21.0% is very good for an investment that would not be affected by the general market movements. Below is the excel sheet showing these calculations. In this example, we have company AskD acquiring company AskE. The offer in this example that AskE shareholders would receive 0.50 shares of the acquiring company AskD for each share of AskE. In an all stock-deal we have to buy the target company’s shares (AskE) and short the acquiring (AskD) shares. This in effect protects you as an investor as changes in the buying company’s share price. 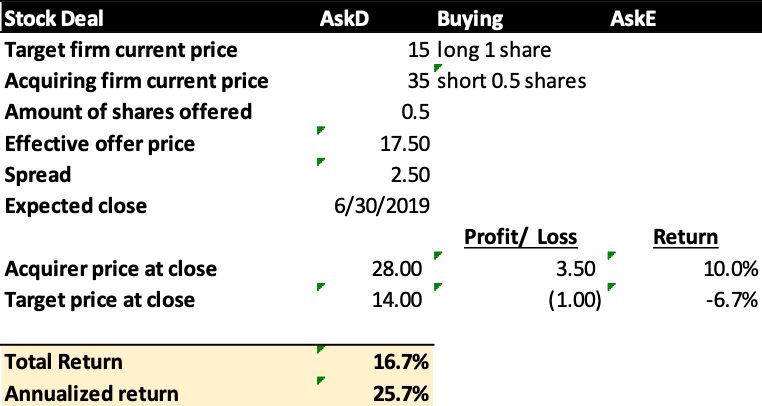 In our example on the day of the announcement of the deal, target company AskE traded at $15/share, while acquiring company AskD traded at $35/share. If we multiply 0.5 by AskD’s share price of $35 our effective offer price would be $17.5/share. As the first part of our calculations. In total we gain: 3.5-1.00 = 2.50. As a quick glance one might think that merger arbitrage is rather lucrative and “easy” investment strategy. Like all other strategies, it is a relatively good investment strategy if everything goes according to plan. For example in our examples, assuming the deals fall apart. The target price share price would go back to where it was prior to the deal. As we previously mentioned that could be as much as 30% as that is the premium that is offered for deals. Furthermore, if it is a stock deal, not only will the target company’s share price fall, but highly likely that the acquirers share price will rally. As an investor, you will take losses on both legs of the investment. Both on the long and short side. Event-driven investing is a subsector of the investing universe in equities. Merger arbitrage is a big part of that. As an investor, with plenty of m&a happening, utilizing merger arbitrage as an additional investing strategy can help with not only returns but also diversifying all types of investments one do. For professional investors, merger arbitrage is an investing strategy that certain investors spend all of their time on. They look and analyze every deal that is announced and assesses if the risks justify the returns. When investors screen for potential deals to look at, they try to avoid deals that are not definitive (basically hand-shake). There no financing issues at all. In addition that there are no further due diligence or regulatory issues. One often try to look at deals where the acquirer is large compared to the target, as these often create the least amount of concerns. Merger arbitrage is a low volatile investment strategy if one wants to look at deals. The downside is that is a bit more difficult type of investment strategy where most of the work revolves understanding regulatory issues instead of pure financial ones. It is a good strategy to look at as a smaller side of one’s portfolio.